…Or at least I tried my best. For the past 15 years, I’ve spent the vast majority of my time living overseas. In fact, I’ve only spent a cumulative total of maybe three years at the most living in the states. For the most part, I don’t really miss the states, in the sense that I can find many similar things overseas, or new things that I like. There are very few things that aren’t available or replicated overseas, at least in the developed nations I’ve lived in (Korea and Germany). Plus the advent of the Internet ensures that I can order anything I want from American stores, and can access American entertainment fairly easily. 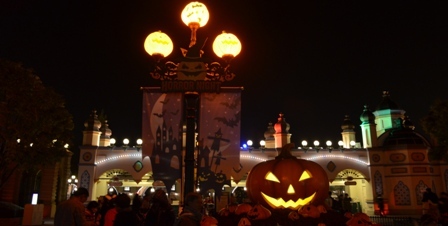 However, the whole Halloween seasonal experience is one thing that is uniquely American and not easily replicated in other countries. It’s not that you won’t find Halloween stuff in other nations. It’s just not to the level and depth that you find in America. 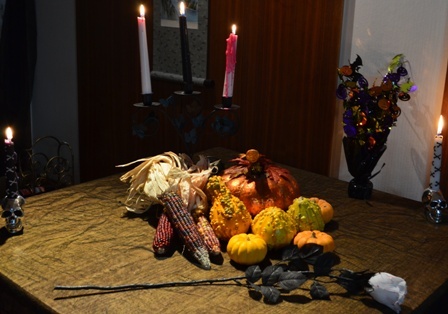 Germany did have Halloween parties, and in particular, there were weekend festival celebrations at the Frankenstein Castle in Darmstadt. Bars and clubs did have costume nights. Trick or treating was somewhat common for German children. But it’s all the other Halloween activities that weren’t very common. 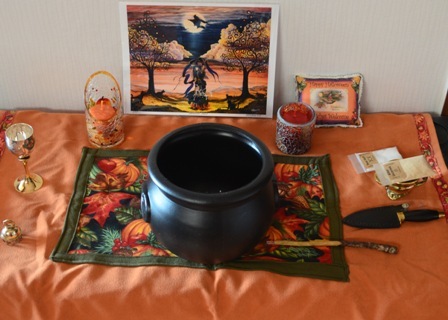 Halloween as it is typically practiced nowadays by most Halloween lovers originated in America. I mean, it’s a entire industry for the season (about early to mid September to Halloween). Halloween decorations sometimes show up in stores in the summertime. Seasonal candy and baked goods are everywhere. Pumpkin spice lattes flood American Starbucks. Pumpkin pancakes abound in restaurants. Basically all forms of pumpkin food are available. 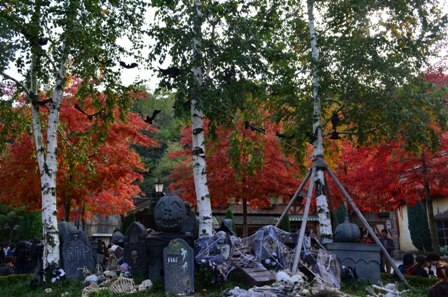 You can find multiple haunted houses, corn mazes, pumpkin patches, costumes, parties. Amusement parks have Halloween horror nights. Bars and clubs have parties with seasonal drinks. It’s everywhere, and I love it. I could fill my weekends with different Halloween/autumn activities for the entire season if I wanted when I lived in America. The last time I spent October in the states was 2009-2010. I went to haunted houses, Halloween Horror Nights, corn mazes, pumpkin patches as often as I could. I’ve spent the past two autumns (2012 and 2013) in Korea. Now autumn in Korea is my favorite time of the year here (as I’ve mentioned in other blog posts), because the weather is very pleasant and nature is especially beautiful with all the colors. 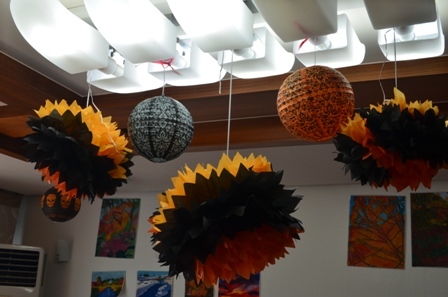 But autumn activities are different than Halloween activities. 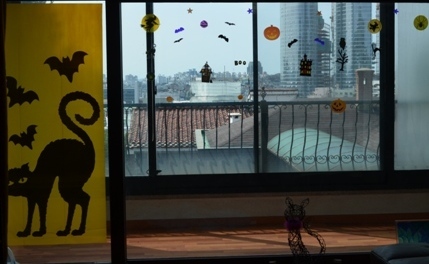 Halloween is not that big of a deal in Korea, outside of the American community here. You can find some costumes sold in Itaewon, the more foreign-oriented district in Seoul. And there are a few Halloween parties in bars. But you just don’t find the number of Halloween activities in Korea. I haven’t seen a pumpkin patch or a corn maze, because that is not the agriculture of this country. I can’t even find pumpkin spice lattes in Korean Starbucks (much to my surprise and chagrin). And there really aren’t the haunted houses in Korea. 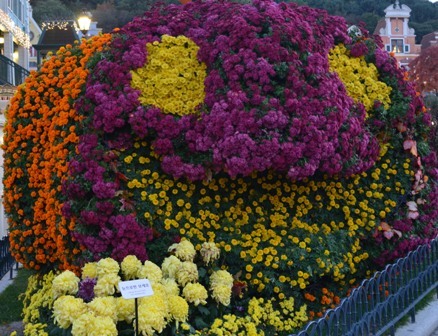 Everland amusement park in Korea is the one exception. 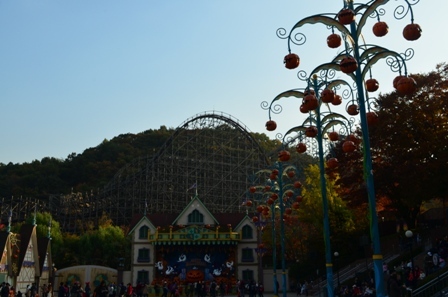 Everland is Korea’s largest amusement park, and it is located in Suwon, which is a city about an hour’s bus ride south of Seoul. 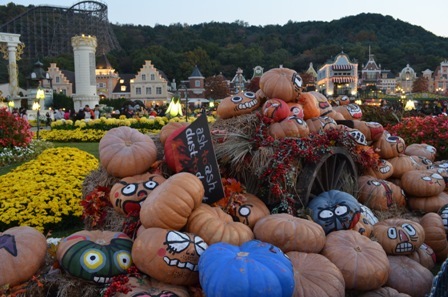 Everland is a fun amusement park, and it’s sort of like Disneyland in the sense that there are different themed areas of the park with rides and stuff, and many different seasonally themed festivals throughout the year. 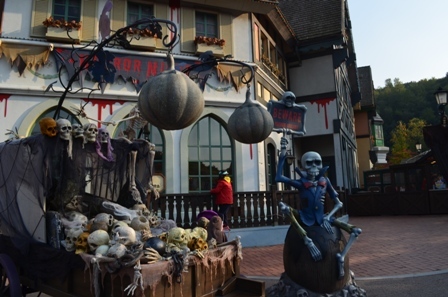 Throughout September and October, Everland has Halloween Horror Nights. 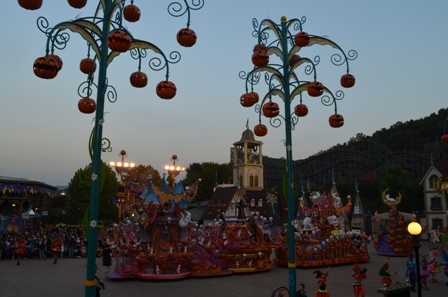 The event consists of Halloween decorations all over the park. When I was there, it was particularly beautiful, because the trees were in full autumn color and it completely added to the ambiance of the season. 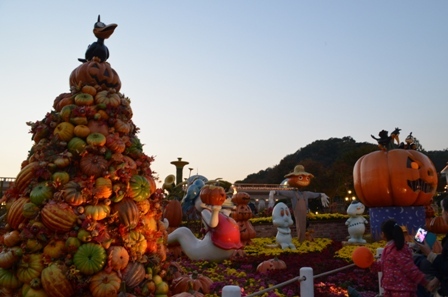 The Four Seasons Garden has Halloween flower decorations and displays and photo ops. 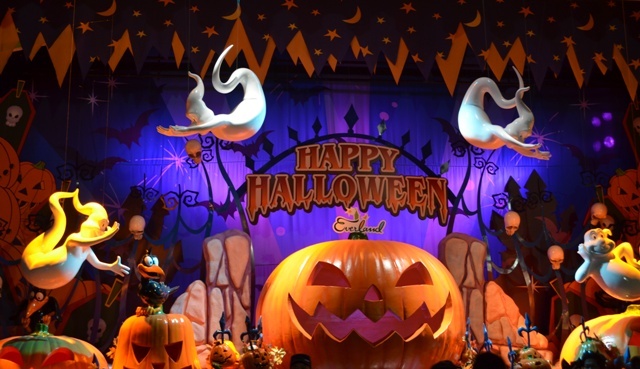 During the day, there is also a Happy Halloween Party parade for the children. Most of the Halloween Horror Nights activities are centered around Horror Village. The two big activities there are the two Horror Mazes and the Horror Club Fest, which is held on Friday and Saturday evenings. The club fest is basically a Halloween style rave, with DJs, dancing, Halloween themed drinks and snacks, and a zombie face painting booth. The Horror Mazes (I and II) are add on events, haunted houses, in that you have to buy a small additional fee to enter. I wish I could say what the Horror Mazes consisted of, and how they compare to the full throttle horrors of American haunted houses. My feeling is that they would be a bit tamer than American gore and blood filled haunted houses, but now I’ll never know. See that sign? I read Korean in the sense that I can translate the letters into words, but I can’t read Korean in the sense that I know what all the words mean (though I do know some words). But I know enough to know that this sign was telling me that tickets for the Horror Mazes I and II were sold out. Yes, sold out, and this was by 4 pm in the afternoon. What you don’t see is me absolutely deflating as my Halloween activity dreams evaporated. 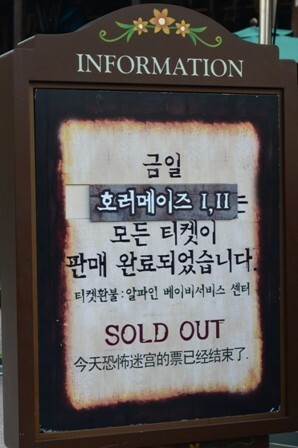 The one place in Korea (that I know of) that has haunted houses was sold out. The one Halloween activity that I wanted to do was now not available to me. Of course I have no one to blame but myself. 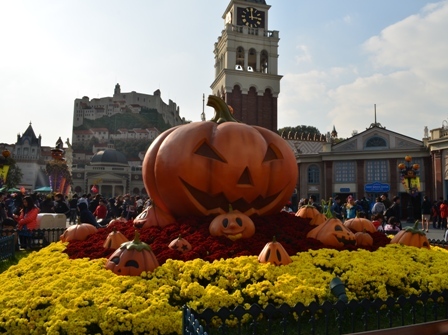 I could have chosen to go to Everland any other weekend in those two months, but I waited until the last Saturday before Halloween, because I wanted to experience it closest to Halloween. I could have gone to Everland earlier in the day and gotten my ticket, rather than waiting to go mid afternoon to maximize the evening time. So lesson learned, but it doesn’t really matter, because I won’t be in Korea for next Halloween. 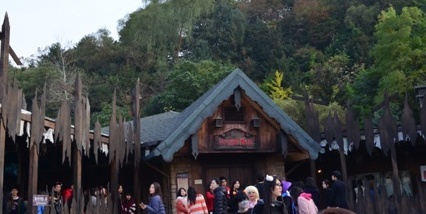 But hey, even though I didn’t get to experience a Korean Halloween haunted house, Everland was still fun. The decorations were nice, the foliage was beautiful. 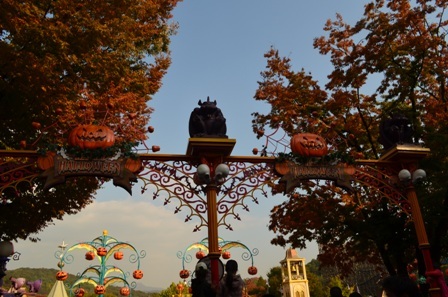 I intend on going back to Everland, though definitely during the work week, because the weekend crowds are just staggering, and I’m not a big crowd person. 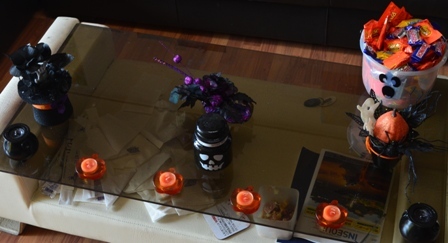 I did decorate my apartment as best as possible, since there aren’t many Halloween decorations on sale here in Korea (thankfully you can buy almost anything online these days). I’m still looking at all the different decoration ideas on sites like Etsy and Pinterest for next year, since I want to progress to more gothic, elegant decorations. But hey, I still love my Halloween superstore decorations. 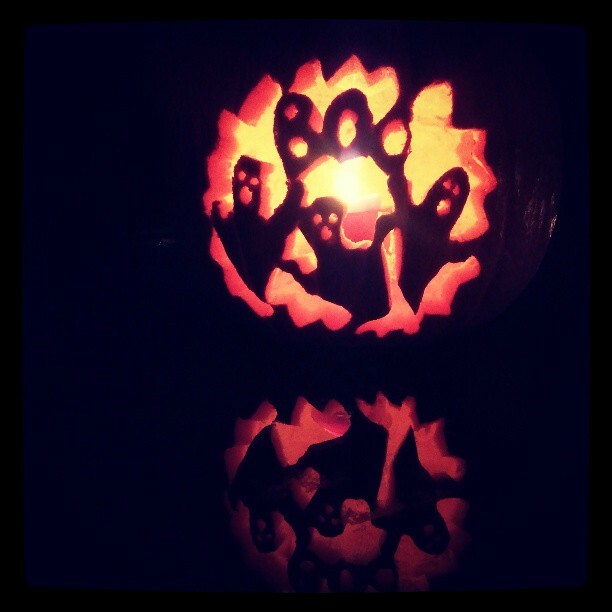 I did get my pumpkin carving on, though thankfully I had the help of a pattern to assist me. Next year, I want to try something more creative. And I definitely need to adjust my carving plans, to prolong the pumpkin so it doesn’t start rotting after a couple days. So now Halloween in Korea is over with. Autumn is still going strong, and will go for another month . I’m hoping that next year I’ll get to spend at least part of the Halloween season in the states, since it is my favorite holiday.